Serbian writer and diplomat Ivo Andrić got yesterday the street in Guatemala City, and the opening ceremony was attended by Serbian Deputy Prime Minister and Foreign Minister Ivica Dačić, who pointed out that this gesture is a sign of a genuine and long-year friendship between Guatemala and Serbia and a symbol of respect and recognition for the works of the Serbian nobelman. 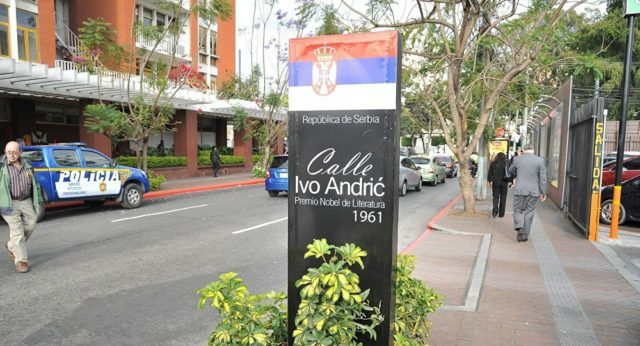 In his personal name and on behalf of the people of Serbia, Dacic thanked the foreign ministers of Guatemala Sandra Polanko and the leadership of Guatemala City for the designation of the street by Ivo Andric. As he said, the decision of the city authorities of Guatemala City from 2017 was made in recognition of the honest and long-term friendship of Guatemala and Serbia, which, the Minister noted, are based on mutual respect of the two peoples and respect for the sovereignty and territorial integrity of the two countries. “This event is a symbol of respect and recognition for the literary works of the Nobel Prize and our distinguished writer Ivo Andric, the laureate of this prestigious award for 1961,” said Dacic.